We are new on bid or buy and getting good response as we tried to put quality products at reasonable price. However, as started from home, we don't have any experience for packing. Can any of the seasoned sellers help us regarding this (packing material and the art of packing products) as our experience as buyer shows that whatsoever product you buy the packing you get is reasonable good independent of the quality of the product in it. As already mentioned lots of tape...no such thing as too much tape ! Also as for Post Office "rules" they don't like any printing on outside, so either you will learn (like most of us) to turn a box inside out or you will have the added expense of good old brown paper (Pep always have) Good source of nice clean boxes would be stationery shops / office wholesalers as they don't reuse for packing that often ! Also electrical wholesalers...usually get a bonus piece of bubble wrap stuffed in. Shredded paper is very useful, and shiny junk mail, as newsprint gives off black ink. Also remember odd shaped / larger items of low weight will cost you more to post than their weight due to the new volumetric calculations so watch out for that. If it is fragile try give a double layer of cardboard around your bubble wrapped and cushioned item (use those trimmed off cuts from the wine box you cut down to add a layer !). I also use the brown paper bag that foodlovers market supplies for their rolls, saves me a fortune in brown paper:blink1:I really like to recycle! Bubble wrap, cardboard and lots of tape goes together like battery and torch. I also make sure items inside boxes are packed so that they don't move around. Never know when parcels are used as soccer balls. I use some security tape on all my items. Its expensive but my customers will notice tampering a whole lot easier. I recommend to my customer not to accept any parcel if they suspect any tampering on the items. ...I use some security tape on all my items. Its expensive but my customers will notice tampering a whole lot easier. I recommend to my customer not to accept any parcel if they suspect any tampering on the items. Like that idea ! Think I'll pinch it !! Excuse the mess in the background but this is what my house looks like when I am busy with a number of parcels. 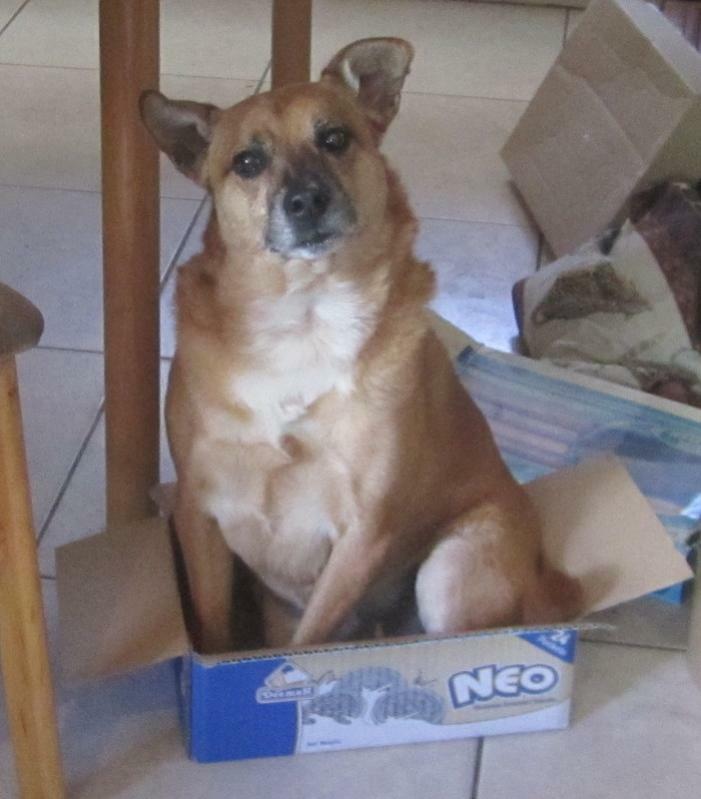 This is Amber our African child.She loves boxes but this is rather a bad choice. - The small one is R6.95. I can fill it up with probably 10 of my most popular items, so shipping is usually free for any additional item. Because of the exact dimensions printed on the box, the box qualifies for Econopost, which is R21.50 a parcel. So I'm charging R30 for shipping.